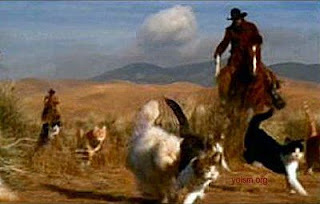 I remember a Superbowl ad that ran a number of years ago that showed some cowboys on horseback riding the range trying to herd … cats! The ad was memorable, but I’d have to say it wasn’t terribly effective because I have no recollection of what product or service they were advertising. In any event, the cowboys were trying hard to get all of the cats moving in the same direction at the same time toward the same goal, but were having a lot of difficulty because, well, cats don’t really like to be herded. This reminds me a lot of managers attempting to “manage” "knowledge workers" (e.g. engineers) [see Knowledge Is Power!]. The desired intent is there, but the results are often not what was intended or desired. Like cats, knowledge workers don’t want to be “herded” or “managed”. In fact, they may simply refuse to be “managed”. There is really an art to “managing” knowledge workers, and if the proper approaches are not used, the results can be frustration and failure. If the “managing” is done right, the result can be positive almost beyond comprehension (see Pigasus - When Pigs Fly!). Knowledge workers (especially engineers) are really different from other people. It’s not my intent to stereotype them, so please take the following with a grain of salt, but knowledge workers typically are highly trained, intelligent, technical, and independent minded. Many knowledge workers (and most engineers) are also very logical. Spock from StarTrek is more often their “ideal”; certainly far more so than Jack Welch or Warren Buffett. They are motivated by challenging work (generally far more so than by money, as long as the money is sufficient), and are resistant to being overtly managed. They respond far more favorably to logical reasoning than to emotional manipulation (see Pound the Facts, Not the Table). They see beauty in the logic of their ideas, and look with disdain on hype and sizzle with little real meat behind it (see Style Over Substance). It can be difficult to properly motivate them, but it is very easy to de-motivate them and turn them off. Knowledge workers come in many different personality types, and often in surprising and complex combinations. In this first of the "Herding Cats" blog posts I will talk in general about “managing” knowledge workers. In subsequent "Herding Cats" blog posts (see Herding Cats 2, Herding Cats 3, Herding Cats 4, Herding Cats 5, and Herding Cats 6) I will discuss some of the different knowledge worker personality types and ways to more effectively motivate and guide them. In later blog posts, I will put Managers (or often, more accurately, "Mis-Managers") under the microscope, and address their personality types, impacts, and ways to handle them. In "knowledge worker"-based organizations, there is a hierarchical structure in theory, but often not in reality. “The Boss” may have earned his or her stripes, but often in what are now aging or outdated technologies or disciplines, and his or her subordinates often have more current technology expertise than “the boss”. Often, it even becomes difficult for the subordinates to explain their “new” approach to the “old” boss. The reality is that “the boss” does not really have the authority and respect that occurs in other organizations. More often than not, “the boss” is more dependent on his or her subordinates than his or her subordinates are dependent on “the boss”, since the subordinates are the ones with the knowledge and expertise to make products, programs, and projects come to life. They are the ones who, through their knowledge and intelligence, can turn complex concepts and ideas into practical, implementable products, programs, and projects. Thus, in reality, the knowledge workers are really the ones with the power, and not “the boss”. Getting knowledge workers to do all the things management wants them to do by telling them to “just do it or there will be hell to pay!” will usually backfire. Telling them to “do it my way or it’s the highway!” will turn them off and result in poor results (if the knowledge worker even decides to stay around). Telling them they’ve got to do their work from 8 AM to 5 PM every workday will also hit them wrong. Instead, it is key to explain to them what needs to be done and why, in logical terms meaningful to knowledge workers, in order to get them to buy in to what needs to be accomplished. If they understand what’s really important and why, and agree with the logic behind the needs, they will generally go out of their way to make things happen. You will often find knowledge workers working all hours of the day and night to get things done that they feel are critical, but their motivation to do so will come from within, not from externally imposed demands. Effective Managers don’t really “manage” knowledge workers in the traditional sense. They nurture, or guide, or convince, or cajole, or encourage, or empathize with, or collaborate with, or motivate them. And they do this in a sincere way that shows them that they are valued and appreciated. If done right, knowledge workers will work their hearts out, putting in enormous time, blood, sweat, and tears to complete a product, program, and/or project . And the results can often be nothing short of astounding!